Hi all! Hope you are having a fabulous Tuesday! I just wanted to share my winner for the MCT Spring Stamp Release. Now remember, this is a finalist and Miss Emma will be pick the actual winner from the list composed from the design team members. I do hope the winner is from my blog.. I will be crossing my fingers!!! I used Random.org to generate my hop finalist. I want to thank each and ever one of you for participating in the hop and appreciate all your lovely comments! Here is a Layout I want to share with you today. 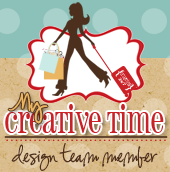 It is featured in the MCT Hello Spring Stamp Set gallery at My Creative Time. I hope you enjoyed today's project. Please let me know if you have any questions. Big crafty Hugs! Nancy ~ BEAUTIFUL layout! So simple, clean with great flare! LOVE the pictures of your children ~ they are just PRECIOUS!